If there’s one thing we know, a fresh coat paint can totally change a room. However, before we could even think about paint colors, we had to get down wallpaper. Fortunately for us, there was only one space that had existing wallpaper, and that was the foyer. 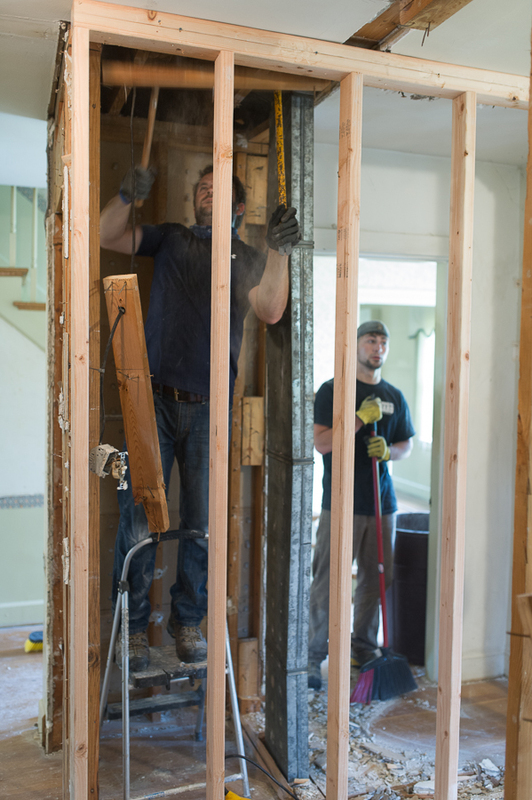 Over the years, we’ve heard many horror stories of people spending hours and hours taking down wallpaper, and were hoping that we wouldn’t have our own war story to share as well in the end. After talking with some of our friends about their experiences, we found that the most popular method of wallpaper removal is by magical powers of a wallpaper steamer. We were fortunate enough to have not one, but TWO people lend us their steamers, and THANK GOD! Honestly, the steamer was a game changer… and a sanity saver… and a relationship saver. You never know what lurks behind wallpaper. For us, we found that behind layer #1 was layer #2. Behind layer #2 was the original plaster, which was in great shape. Over about 4 nights, working 4 or 5 hours a night, we were able to tackle all of the wallpaper. Once you get the hang of it *pun intended*, you can really speed through it. Before you know it, you’ve got a really big sticky, smelly pile of wallpaper. It truthfully wasn’t that bad and we knew what we were working towards, so the sweat equity made it all worth it. 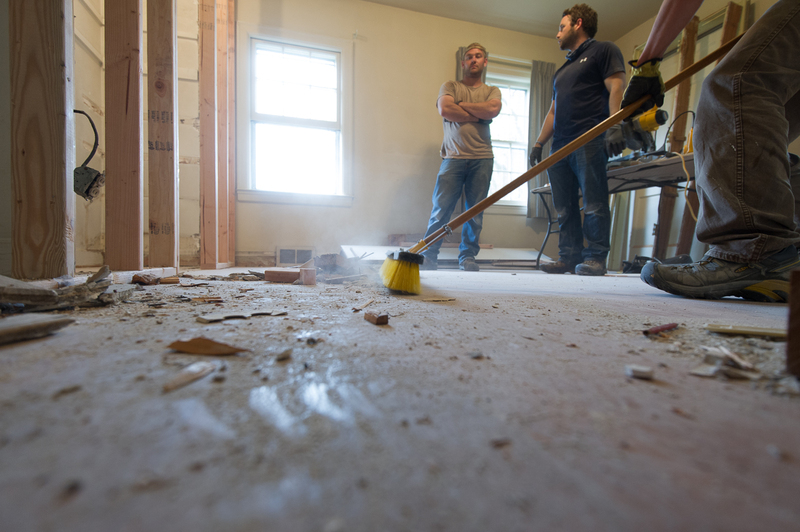 Before the ink was even dry on the contract, the half-bath demolition commenced. Our house only had one full bathroom on the main floor, but more storage than we knew what to do with, so the plan was to combine two coat closets off the foyer into a half-bath for all of our guests to use. Fortunately, for sake of the house, we weren’t the ones doing the work. That’s why we hired wonderful contractors! That wasn’t the only project that started on day 1! The foyer and dining room floors had been covered over with the ugliest vinyl tile flooring east of the Mississippi! And probably west of the Mississippi too, for that matter. We knew that we wanted to rip it up, but we had questioned what the situation was like underneath the tile. Was it beautiful hardwood or was it hardwood that had been destroyed? or God knows what else. We had a chunk of it removed and tested for asbestos. It truly wasn’t as scary as it sounds, but we wanted to make sure we weren’t going to be part of a class action lawsuit with mesothelioma. Fortunately, it was negative…. so up it came. Beneath a sea of a thousand nails and staples, the floor was actually in great condition. It just needed to be refinished. After the vinyl tiles were ripped up!